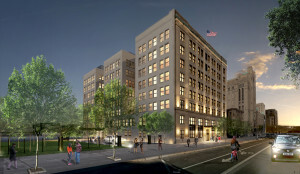 The Albert Kahn-designed building is right by the Masonic Temple, and plans call for both residential (70 apartments) and a 100-room hotel. The design is being led by McIntosh Poris Architects, who also led the design of the Foundation Hotel. This should be a great boost to the neighborhood, further connecting the areas between the Little Caesars Arena and surrounding district and Midtown.